It appears that iRiver is flowing with all sorts of new ideas with the WAVE-HOME, and their Libre e-book reader. So what’s next for this company? Try a waterproof MP3 player. The LZR Aquabeat Racer was designed with the help of Speedo, everyone’s favorite company for tight swimsuits. 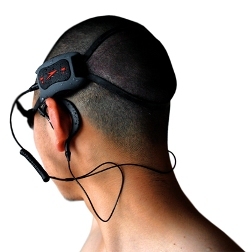 As you can see, the Aquabeat Racer affixes to the head, but it is far from wireless. As for the memory, the LZR has about 2GB, which is enough for quite a few songs. Unfortunately, the battery life in the LZR is only good for 30 minutes per charge. Yes, the LZR is waterproof, but I wouldn’t take it scuba-diving. It is only good for about ten feet, so this is probably a device you’ll want to use when you’re doing laps in the pool, just stay away from the diving board. It has nothing to do with the depth level; I’m just not certain this device would stay on your head after a dive. You know how you can literally lose your shorts after a taking a plunge? It looks like that could apply here with this headgear. So, for all the swimmers that want their tunes, you’ll have to lay down $145 for this player. Unfortunately, it is only released in Japan.